Here we are – it’s already Week 2 of the One Room Challenge and while I feel like I’ve been hustling, I haven’t actually started any of my own “fun” stuff yet. If you missed Week 1 (what the ORC is, what I’m doing, etc.) you can check it out HERE. This week has basically been a construction week. We’ve been camping out in the guest bedroom (anyone else know how fun it is to sleep two people and three dogs in a queen sized bed? ), so I think when our bed gets here, Dave’s going to be even more motivated than me to get things going in the room! My biggest investment for this room is the walls. Believe it or not, they are actually the same color as our great room but our bedroom is so much like a cave, that they just felt way too dark. 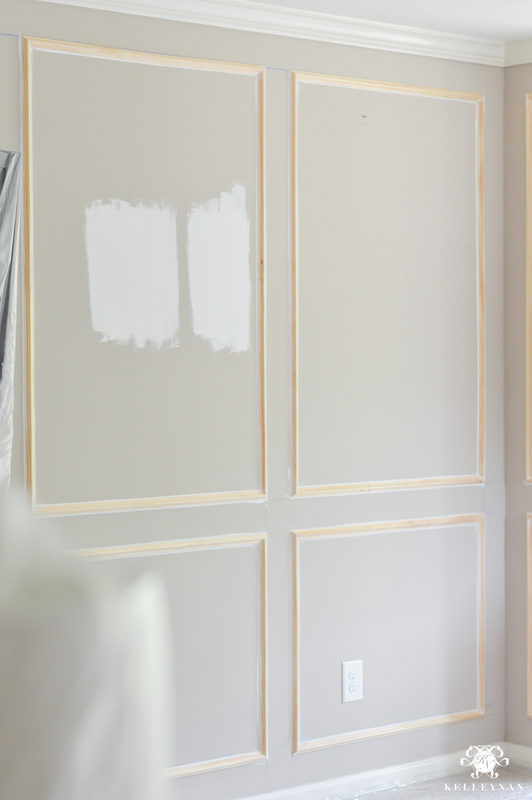 I could have gone for a wallpaper, come up with a feature wall, or just gone with a paint update but I have been dying to create paneled walls and add a lot of molding detail. So, I decided to go for it and panel my entire, too-huge bedroom. Metrie, which has a huge selection of interior finishes, partnered with me to take my palette to the next level. My carpenter Darryl Ponquinette of Ponquinette Fine Woodworks (who also custom built my office cabinets HERE) took on the project and as always, was a true dream. He came over (and of course I walked him through every room in my house so he could hear my dreams of “one-day-plans”) and we went over my vision. Simple boxes, taller on top, shorter on bottom, no chair railing, nothing too ornate. Because my ceiling is vast, and vaulted, and boring, I wanted to add something but didn’t know what. 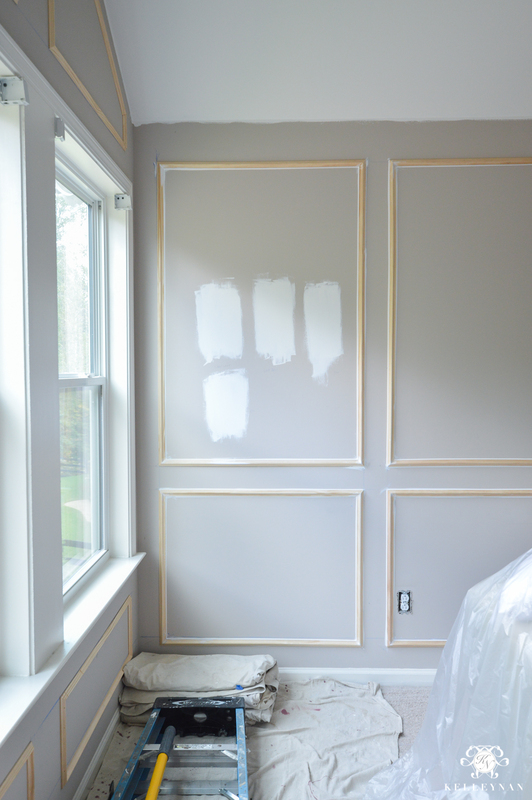 He suggested a simple trim box molding for just a subtle detail. Since I am going monochromatic across the entire room, he thought it would add just enough detail while still being simple. I relied on him totally when it came to selection, footage, etc. Metrie has a TON of gorgeous options so it was helpful to have someone interpret my vision and then go through everything to narrow it down for me. He sent me appropriate trim options (I went with THIS ONE– a 1 1/8″ solid pine panel mould) and said I would need 560 feet. Y’all, for someone who knows nothing about trim and is clueless when it comes to footage and guesstimates, that sounded like a ton. Well, Darryl was right on the money because when he finished, he used every single last piece. It didn’t help that on Day 2, Darryl and his partner came back from lunch and found Maggie chewing on some of their cut pieces. Dead serious. Metrie has a facility in metro-Atlanta so Darryl was able to swing by and pick up the entire order. 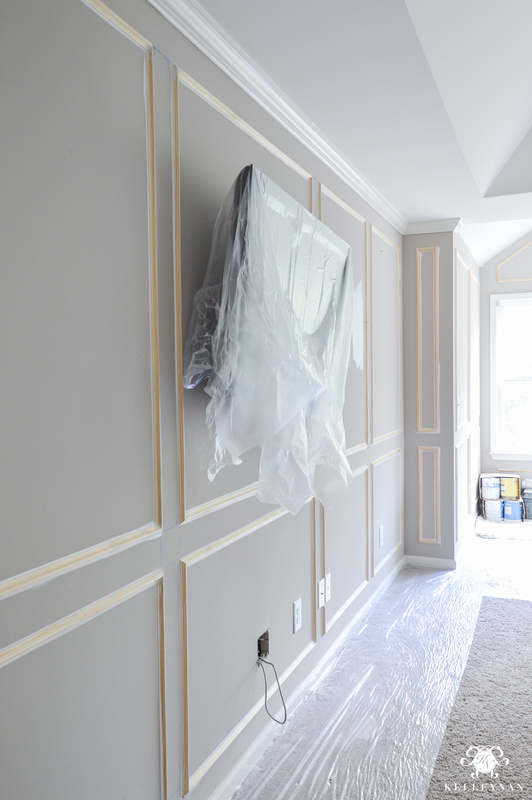 Between measuring, sketching, cutting, and installing, installing the molding took two solid days. And, I am so totally obsessed. The next order of business was getting this bad boy painted. I was most definitely not up to the task of caulking, patching, and layering on coats and coats of paint in this arena of a room so we hired out for that, also. Actually, it is Day 2 of painting and it is being (hopefully) wrapped up as I type! It took our painter hours and hours just to get everything caulked- bless his kind soul. Because this is a dark room and I wanted to brighten it up, I wanted something crisp but not too cool, creamy but not yellow. I did a good bit (ok, a few Pinterest searches) of white paints before I decided to test Cloud White, Chantilly Lace, Simply White, and White Dove, all by Benjamin Moore. I tested close to the window and also in one of the more shadowy areas. Y’all, picking out white paint isn’t fun. Your eyes start to play tricks on you and you have to work hard to pick up the undertones of the swatches to try to envision what it will look like in the entire room. I wanted something that would look good in bright light but also in the darker parts of the room. I stared at it during the morning, at night, and during overcast periods of the afternoon. 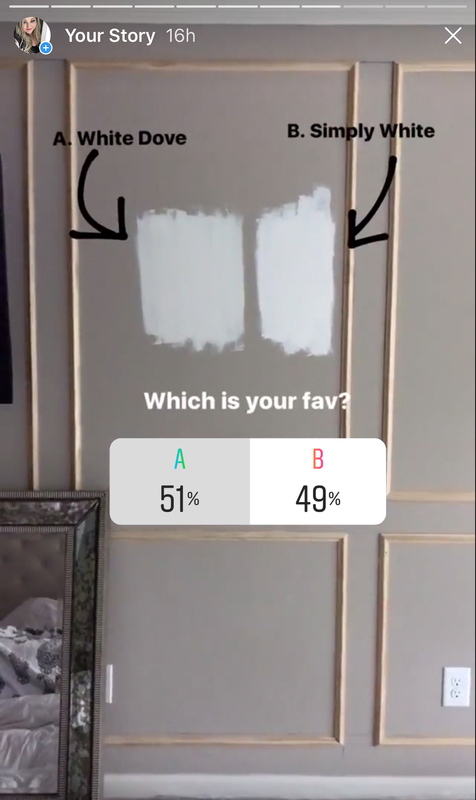 When I narrowed it down to White Dove and Simply White, I took to my Insta-stories to get a public opinion. The polling results were almost tied but those who were for White Dove were REALLY for White Dove. I think there may be some sort of secret White Dove club because those who had used it were more than passionate about it haha. Ultimately, I decided on Simply White (on the right side) since this room will continue to battle the lack of natural light. How many gallons you ask? Seven. Yep, SEVEN! Eight if you count the primer. Three for ceiling in flat and four for walls, trim, doors, etc. in eggshell. I don’t know yet if we will have any leftover but good lord, y’all! Like I said, it was an expensive week. Maggie basically supervised in the construction zone. She wanted to be everyone’s helper but Darryl, Kenneth, Alfredo… none of them really wanted her help. Can you blame them? 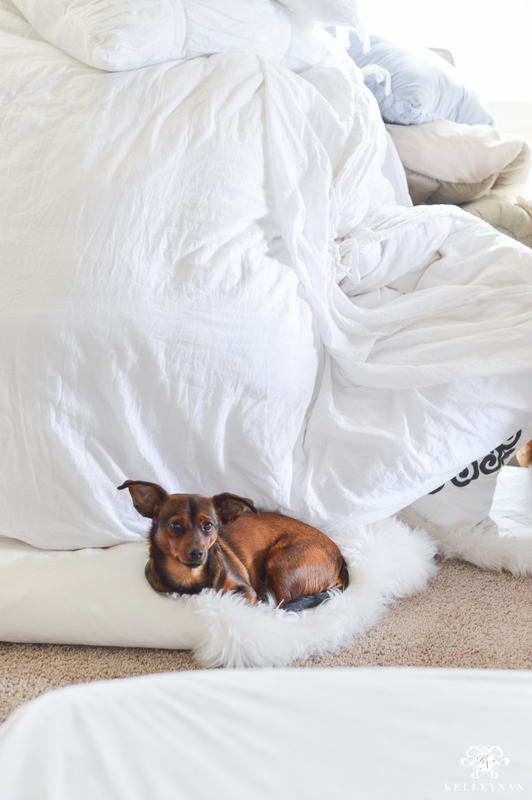 haha I think she settled on the assumption that we were building her a giant pillow fort. A peek of how massive this room is… that’s a LOT of wall and a LOT of ceiling! Speaking of ceiling, I got a quick shot before Day 2 of painting. Here it is with two coats; what a difference in brightness! 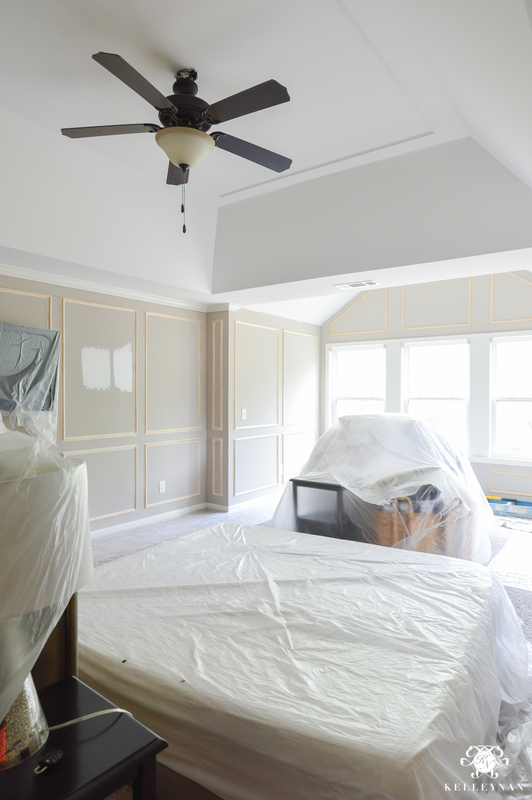 I’m dying to see the entire room painted in white. And Darryl’s simple molding suggestion on the ceiling? I LOVE it. The fan is coming down and I think it is going to be perfect in framing the chandelier. Next week, we should have a painted room, a bed (maybe?? ), and some furniture in place. Woo! (Should and will are two different things though when life is happening 😉 ) Speaking of beds, we sold ours this past week. So bittersweet but I am thrilled with what’s on its way! Ok, I am actually starting to panic a little. A few things are on their way but I haven’t even started to think about others. With Dave and I heading out of town the first week of November, I have to get things picked, ordered, and get them in ASAP. Y’all, the sweat! Seriously. A huge thank you to Metrie for their generosity in sponsoring my new molding materials; I am so excited about the updated bones of the room, thanks to my new walls! To get the latest updates each week, you can sign up for my emails at the bottom of this post. Check out the other bloggers and their project progress on the link-up page HERE. And, you won’t want to miss the 20 featured bloggers (HERE). It looks great! Love a paneled wall, but have a little bit of PTSD thinking of all the caulking. 🙂 Can’t wait to see it painted! HAHA Charlotte! I know- thinking of all the prep to get everything painted was overwhelming. Kudos to those who DIY it because I think I would go straight to the crazy house after I finished! I think I’m in love with this project!! 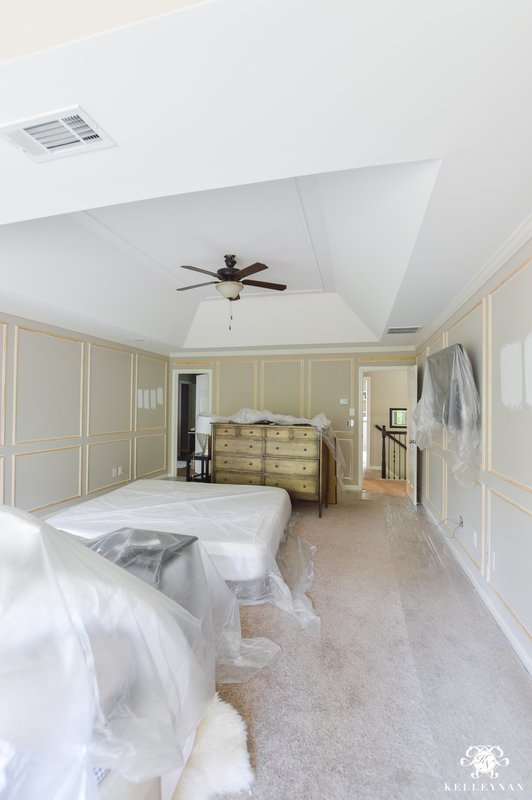 The paneled walls are such a statement…without being overbearing. Just perfect. And I love all the classic neutral picks. Can’t wait to see! Laura, thank you so much! I am so incredibly excited. I wanted a statement without it being a loud statement and am so thrilled with how it is turning out! wow! love the panels and so much work to put them all up perfectly! that ceiling is to-die-for as well! looking forward to seeing the space coming together! Tim, thank you so much! 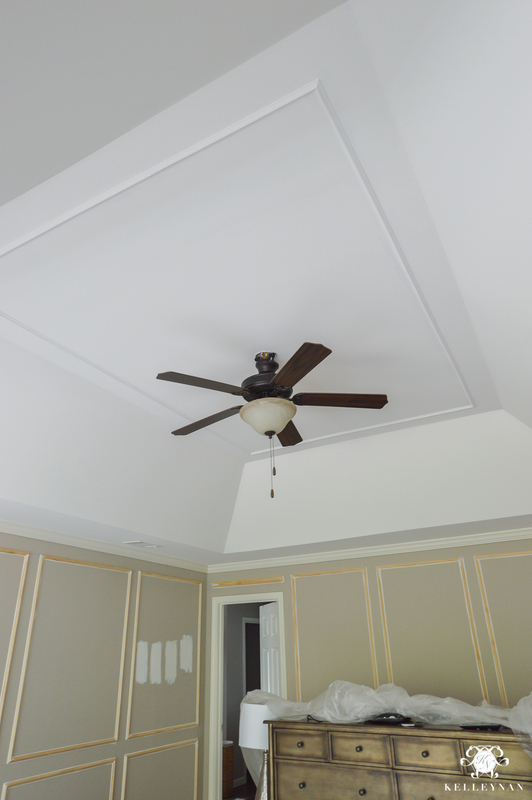 I love the ceiling too which is crazy because all that was added was one simple piece of trim. Thank you so much for stopping by! I’m already loving what your doing so far. I’m jealous of the size of your room and can’t wait to see it finished! Love what you’re doing as always. Your ORC posts are some of my faves. But I totally feel you on size of bedroom. Our floor plan in the same way. This bowling alley sized master complete with its own foyer and halls, but NO linen closets. Yes, NO linen closets in my entire house. Don’t even get me started. LINDS! No linen closets?! Your new home is a true work of art- I am going to miss you tonight but you need to stay put and finish baking that little peanut! 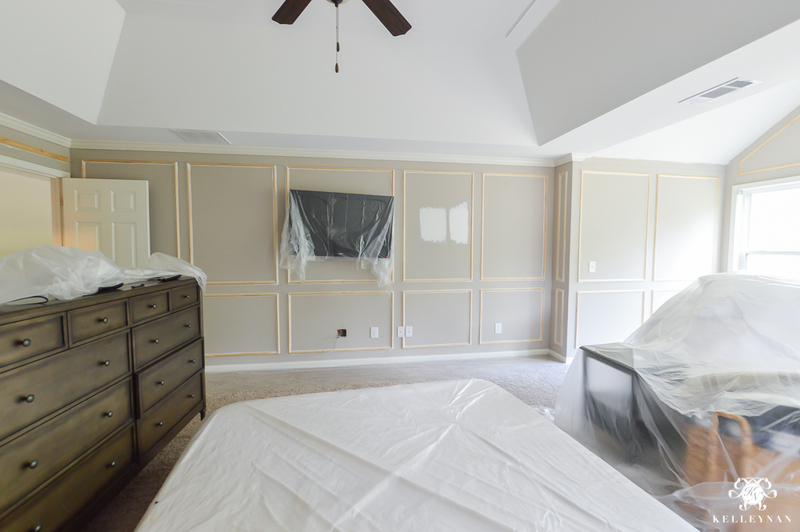 The molding panels look fantastic!! I look forward to seeing everything swathed in Simply White! It should be bright and so beautiful. Deb, thank you!! I think in the darker room the Simply White was a good call; I am just starting to get overwhelmed by all that still needs to be done! 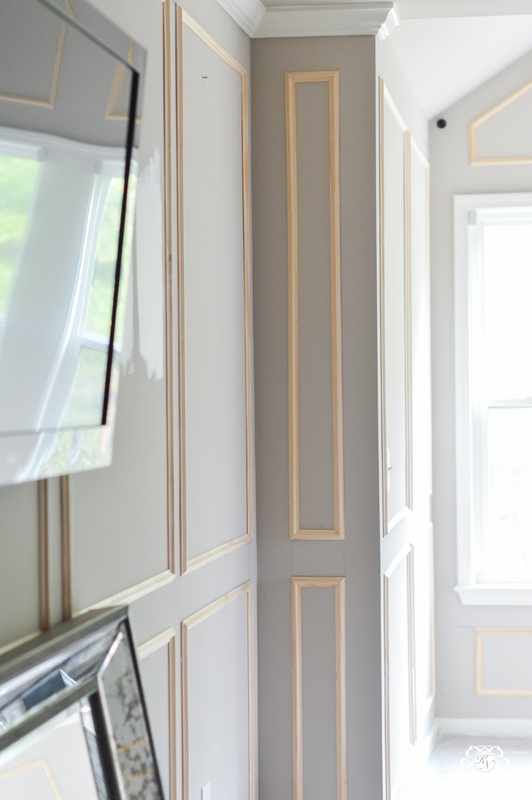 This is a perfect example of how much adding trim can change and add character to a space! Love it! So excited for you…it’s going to be fabulous! Can’t wait for the final reveal! Joan, thank you! I am so excited (and nervous) for it to come together. When you get the nightstands I would really really love to know how the quality is. Do the drawers glide nicely or is it just wood on wood? And also I would love to know your description of the color. I’m doing my master soon but I won’t pull the trigger becasue I don’t want to part with our old/dated/ugly nightstands until I find a new one I would love to use and nothing I find seems to have the look AND quality I am seeking. Jen, I absolutely will! They are set to ship at the end of the month so they will be one of the final things added. What is your floor material in the master bedroom? I need to change my carpet in our’s. Butts to real hardwood and bathroom porcelain tile. Need waterproof because only bathroom access for pool is thru our master. Jen, I need to come see your progress in person! And yes, crazy how bright it has made it! Jess, it is officially painted and I am thrilled! Crazy what a difference it makes! The walls are going to be gorgeous! Cannot wait to see the end result of this beautiful bright space! Libbie, thank you! I am loving the new bright white! This type of molding is definitely not a good fit for my house (50s MCM Ranch) but I could see myself doing something like this in a future more “traditional” styled home. Taking notes for a future place! Love the paneling! Your room is ginormous! Can’t wait to see more! Vel, thank you! I love it too- such a difference I’ve decided to keep the walls mostly bare to let it be the focal point. The picture molding throughout is perfection. And yes, I would so not want to attempt caulking all of that! Love the paint color change as well. Even with just the ceiling the room is so much brighter. I hope to lighten our paint colors up next time we paint. Now that our trees have matured the house is too dark for my liking despite all the windows we have. It was such a pleasure meeting you and Mama Nan today! You are just the sweetest. Lauren, I LOVED meeting you! And just thinking of all the time he put into that caulking makes me want to hide haha. 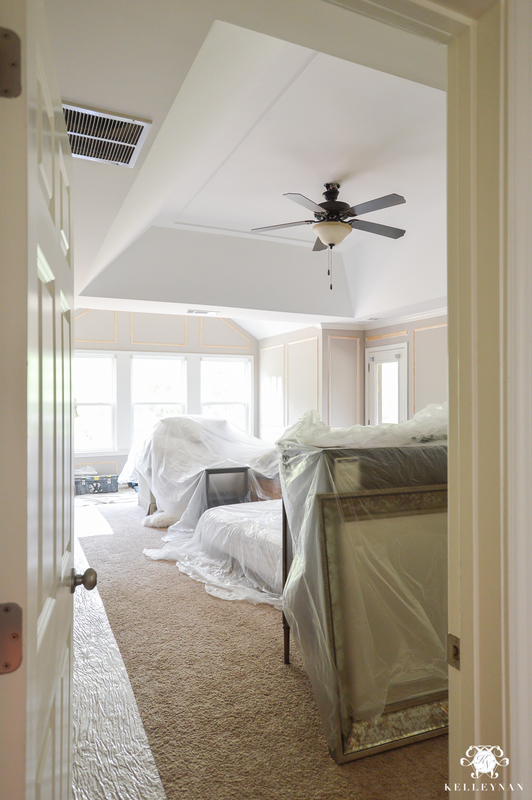 In the great room, the greige paint looks light but in the bedroom, it just seemed like a dungeon. Loving the switch-up! 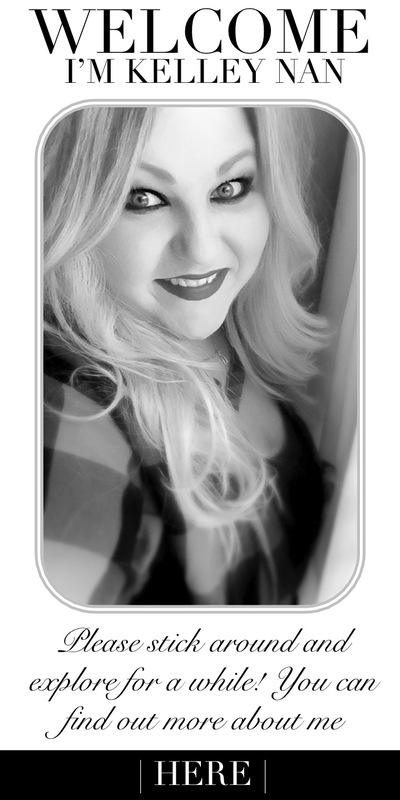 its going to be beautiful….i cannot wait for the final reveal. I am excited for you.